Community Support Officer, Helen Farr is delighted to report that the new Gnosall Community Managed Library opened on 20 February 2019. As well as a full range of books for adults and children, the library also provides a computer with free internet access and wifi. Being attached to the Youth Club building, means there is a space for people to study or to relax on the comfortable seating. The Committee and volunteers are also already thinking of activities that they can run in this area in the future. 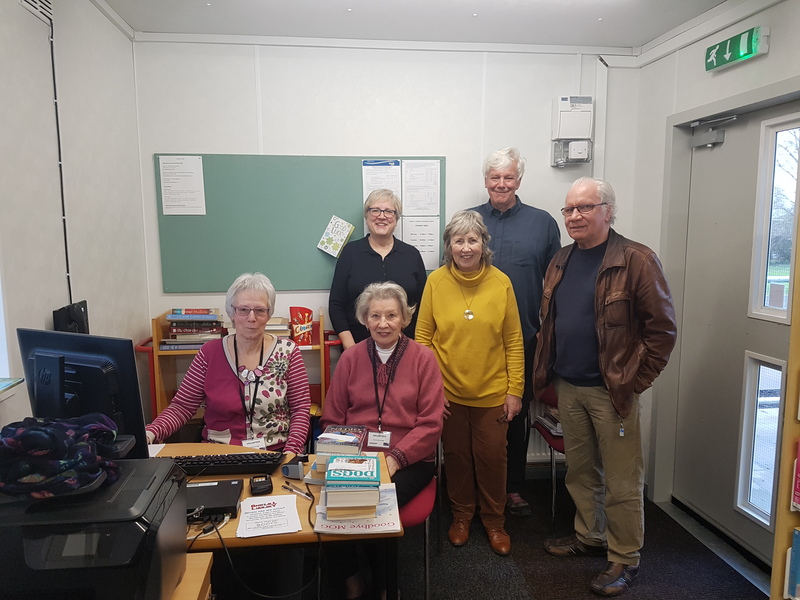 This is the culmination of a huge amount of hard work by a group of volunteers, backed by Gnosall Parish Council, who put together a successful bid to Staffordshire County Council to set up and run a new community managed library. 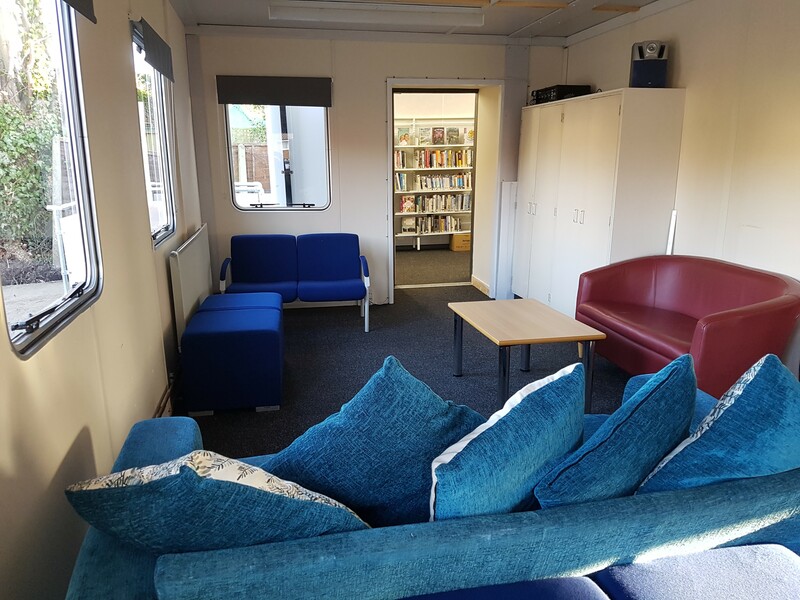 They found a site near the Grosvenor Centre, got permission from the Charity Commission to set up GLEAN (Gnosall Library Environment and Nurture) Hub CIO and worked with the Parish Council and Staffordshire County Council to set up this new library for the local community. They have raised substantial funds of money, and have had to overcome a variety of challenges over the past few years, to achieve their goal. Congratulations to them for their determination, and a huge number of volunteer hours given, to get this project completed! After the first session open for Gnosall Community Managed Library, around 120 people packed into the Grosvenor Centre for a folk evening in aid of the library! 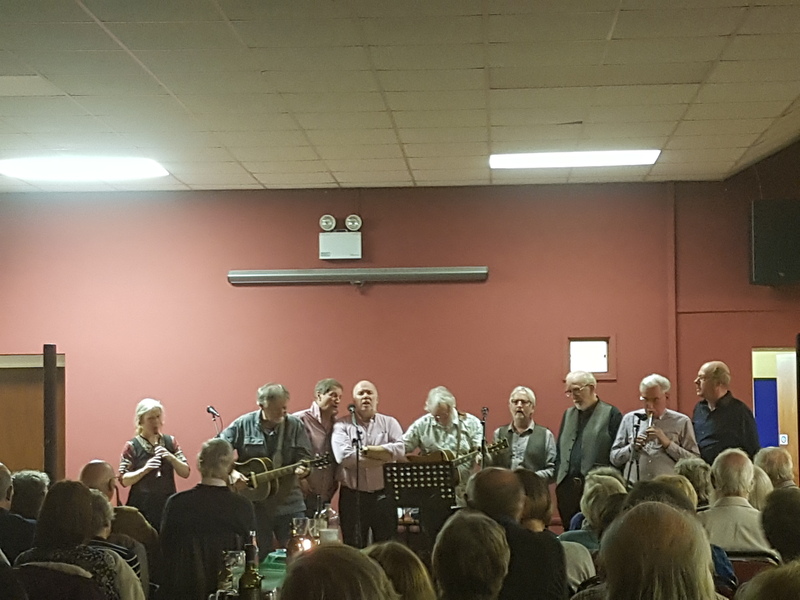 Three local folk bands, The Deacons, Spring Chickens and Small Change, kindly gave their time free of charge to raise money for the library – many thanks to them for their support. GLEAN also ran a raffle on the night, and the whole evening raised almost £1,000 in total! It was amazing to see the turnout and support for the new library, and the money raised ensures that the new community managed library starts on a great footing financially. 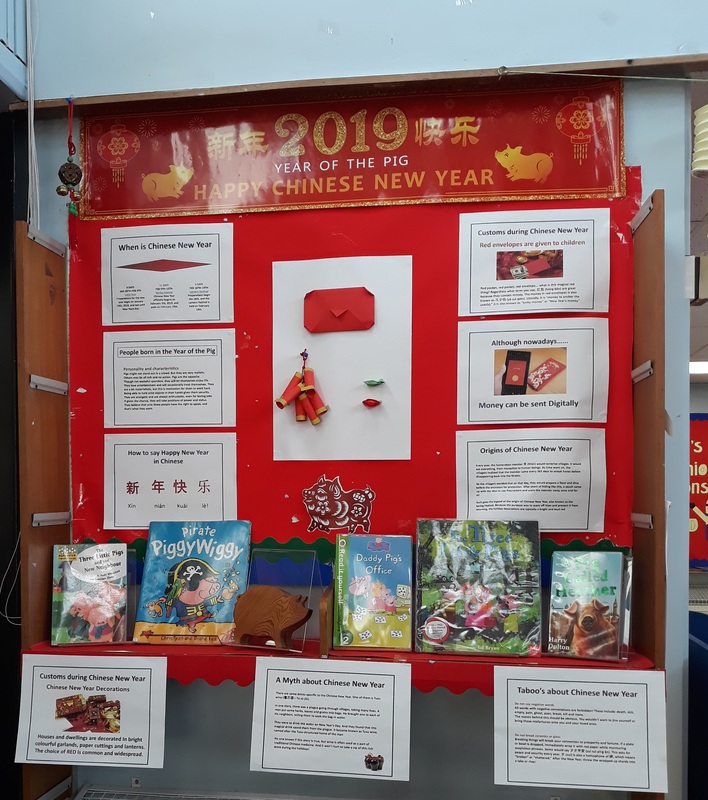 Volunteers have been putting their creative skills to good use at Baswich Community Managed Library to celebrate the Chinese New Year 2019 – the Year of the Pig. They put together a display for children, to promote all the library’s children’s books which involved a pig character! A family craft event was also held for adults and children to learn and practice the art of Chinese paper folding. As well as promoting our library stock, 9 adults and 6 children enjoyed making paper folded pigs – a craft activity which provided an opportunity for families to learn and have fun together. Great Wyrley Community Managed Library were happy to receive unrequired shelving from another library to improve stock presentation. Working with volunteers, Cathy Attwood Community Support Officer helped with the move around, positioning the shelving and putting the books back into place as well as dismantling the old shelving. The new shelving is on castors so gives flexibility and can be moved which is so important in a small library, the shelves are lower and improve accessibility for customers as well as helping to open the library and make it feel more spacious. This demonstrates working together and resourcefulness by taking advantage of opportunities as presented for a win win. The success of the Zen garden at Norton Canes Community Library has resulted in two further donations. 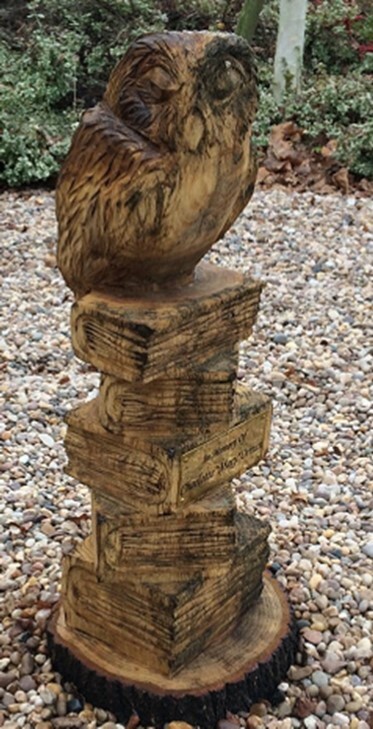 A monetary donation in the autumn was presented to Norton Canes Community Managed Library in memory of a lifetime library user and has been used to purchase a Wooden Owl sculpture that has now also been added to the garden. 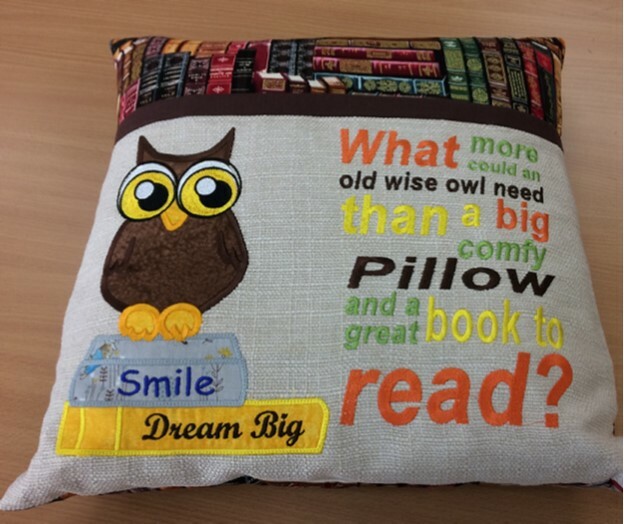 This in turn has further inspired a handmade cushion featuring an owl which was made by another library user. This cushion is being used as the prize for a “Name the Owl” competition. Appreciation from library customers gives drive and job satisfaction. 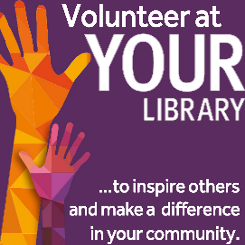 The volunteers thrive on such feedback, feeling valued gives them momentum and is the reason that they volunteer at the library. Come and meet the Goblins at Cheadle! As the CSO for Cheadle, Michelle Jackson will be holding some more Meet the Team sessions very soon. Some of the team will include Goblins! Yes, the Goblin Group meet on certain Saturday mornings in the library. 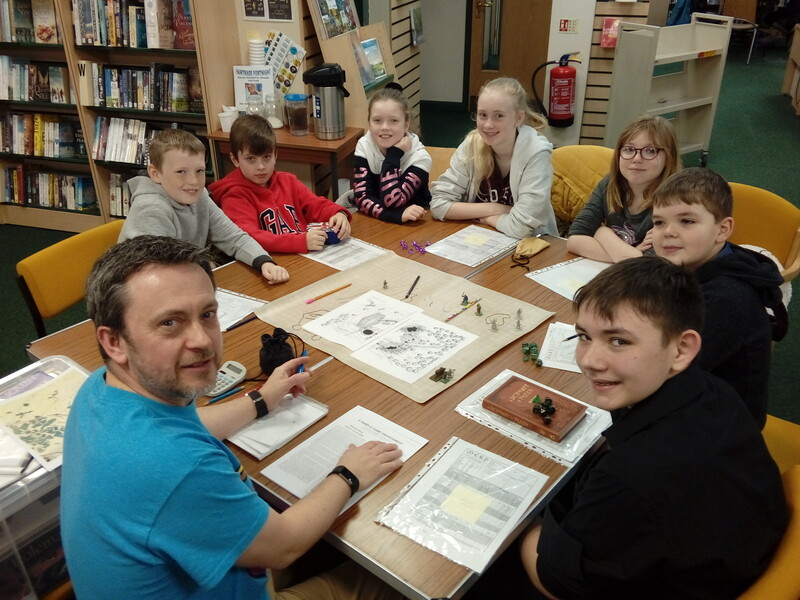 The Role Playing Club is run by volunteer Craig Burton, its aimed at young people aged 10 years an over. It is hoped that these sorts of exciting events and activities will continue in the library once the CCIRG take it over. Obviously, it does all depend on the volunteers and their commitments. 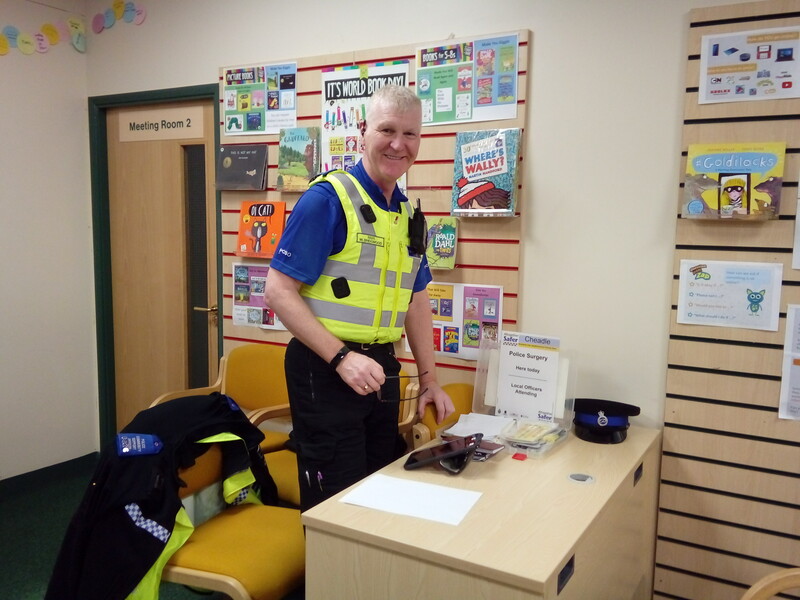 One well known face, sure to remain a monthly Saturday morning fixture is PCSO Mark Bridgwood. He is available in the library for a quiet word or too, should the need arise. Cheadle has a huge range of activities and events on offer and it was great for me to meet up with some of the people that regularly come to the library. The Goblin Club has recently featured in the Cheadle Times and Echo on 16th January 2019 and 13th February, showing that they are keen to continue and promote their fabulous fun sessions. Great publicity for the library! 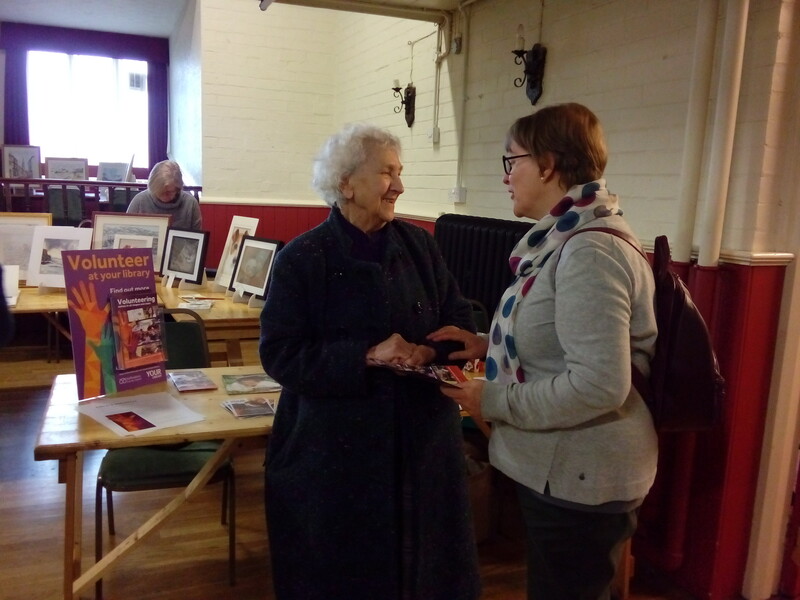 Michelle Jackson, CSO for the newly formed Cheadle Community Information and Resource Group (CCIRG) attended the excellent Arts event on Saturday 16th March. The range of art on display was superb and very inspiring. It was a great opportunity to talk about the forthcoming volunteering opportunity at Cheadle and to promote the library and its events. The photograph shows Jenny Morrey, from CCIRG, (on the right) talking to a prospective volunteer on the day. It was a great way for the community to meet the prospective members of the group in a relaxed way. Michelle particularly enjoyed the band who were up on stage entertaining us and keeping the session so upbeat! Some members of the CCIRG group were there too and one volunteer came along for a chat, with a completed application form. After talking to the various stall holders and art lovers who came along on the day it was clear that there was lots of scope for future events, artists in residence and craft activities to explore. The group were really pleased with the day and I was glad that we had the opportunity to meet so many people. Werrington Community Managed Library‘s Knit and Natter Group meet every Wednesday in the library, knitting for the Neonatal Ward at the Royal Stoke Hospital. You may remember from last time that the group were nominated for the Moorlands Heroes Award by the daughter of one of the knitters. Well, Community Support Officer, Michelle Jackson, is happy to report that the group won a Commendation Certificate at the Awards night at Alton Towers! The Leek Post and Times ran the Award to recognise the support that groups like this offer in their community. The group really do deserve their award will take great pride in their achievement. Fabulous news! One of the Kinver Community Library volunteers recently went on holiday to Iceland and couldn’t resist visiting the local library. As a much bigger library (in the second largest town in Iceland), she came away very impressed, with lots of interesting ideas to share back home, including using shopping trolleys for both staff and customers to carry books around and the arrangement of picture books, which will be investigated further to try out in Kinver very soon. This just goes to show the commitment and enthusiasm of our volunteers, who have an appetite to seek out new initiatives, even when they are hundreds of miles away, with their minds still very much focussed on ways to develop the service. A small group of volunteers at Kinver Community Library recently came together with the view to improve the furniture and layout of the children’s library. Various ideas had been implemented previously including removing a free-standing bay of shelving and introducing a settee and high chairs and volunteers felt it was now time to review the area to see if changes needed to be made. With input from the Community Support Officer and the Stock, Services and Activities Officer, the children’s books were edited and arrangement was discussed. 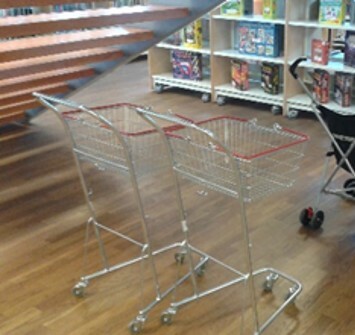 With the settee and high chairs gone, the area has opened up tremendously, complimented by some new furniture including kinder boxes, cushions and a unique caterpillar display unit. Volunteers are not afraid to implement new ideas and change it if it doesn’t work. The Children’s Library is fantastic open space where stock has been rearranged to ease access and flow and moving the display shelving has made a great impact walking into the area, creating a flexible and welcoming space while showcasing the book stock effectively.